Though crowds make me claustrophobic, I could not miss an evening at the Putzchen’s Market. 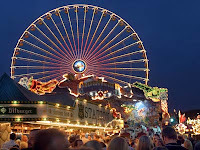 It was touted as the biggest folk festival in North Rhineland Westphalia. A sprawling fun world had sprung up overnight at a village in Beuel, in the first week of September, and lasted for five days. The night was a riot of colour and noise. Twinkling lights in rainbow shades had turned this small village into a wonderland. Streams of revelers pushed and jostled their way through narrow streets lined with temporary shops selling trinkets and souvenirs from Asia to Timbuktu. Eateries were stocked with mounds of crunchy hazelnuts coated with sugar and spice, and yellow heaps of pop corn. The place reeked of beer and fried wurst. (sausages.) Disco tents and giddy roundabouts, quaint cartoon characters blown into gigantic balloons, and the beckoning giant wheel looming into the skies, offering a bird’s eye view of this riotous fantasyland, were what brought in the crowds. The water was also supposed to have healing properties. So every year thereafter, pilgrims came here to ask for favours. Many of them camped there for days. Their requirements of food, wine, water and sundries were provided by hawkers and itinerant tradesmen, who travelled with them. And so, the Pilgrims’ Market was born. Adelhaid the pious woman was the daughter of Count Grafmegangoz and Gerberga. Her father built a church here, and she became its Abbess. She belonged to the Benedictine Order. She founded a Cloister School for poor children and personally supervised its running. She also opened a hospital for the poor and disadvantaged. She died on February 5th, 1015, and her body was interred in a crypt in the church. A blind man was said to have received his sight thirty days after her death. Pilgrims flocked to this church expecting miracles. But during the Thirty Year Warm the church was completely destroyed. So another church was built close to the Putzchen. Today however, there are no pilgrims. Merely revelers and fun lovers who flock to Putzchen’s market during the festival. Traditionally the market is declared open by unsealing a barrel of beer on the church premises. Profits made by the market are donated to UNICEF.